The Altantic humpback dolphin were first scientifically described by Kukenthal in 1892. 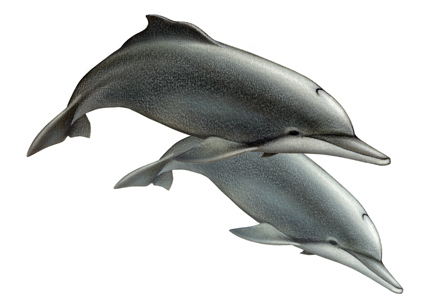 They belong to the humpback dolphin family, and are members of the genus Sousa. Atlantic humpback dolphins can be as long as 2.5 metres. They weigh approximately 150 kg. They are pale grey in colour, but they do have some speckled markings as well. They have a large melon, well-rounded flippers, and a long beak. 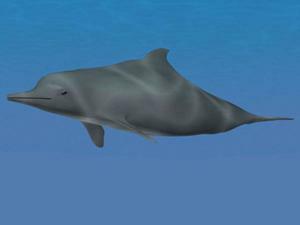 Their dorsal fin is 15 cm high and curves to form a hump. Their pectoral fins are 30 cm long, and their flukes are 45 cm wide. These dolphins have 26-31 pairs of peg-like teeth in each jaw. These teeth are homodont, meaning that they are all the same. In terms of speed, they are one of the more slower species in the Delphinidae family. They will dive for up to 3 minutes under water, and will jump out of the water. Other characteristics that the Atlantic humpback dolphins have in common with the rest of its family include a high brain to body-ratio mass and echolocation. The Atlantic humpback dolphin is found off the West African Coast, from Angola to Mauritiana. It can be found in shallow coastal waters, estuaries, and river channels. It is thought that this dolphin stays close to the shore to avoid predation by killer whales. This is because the presence of land mass interferes with the orca’s echolocation sense. As a result, some Atlantic humpback dolphins have sought refuge in reefs as well as near the ocean floor in deeper waters. They are solitary species and have been observed both feeding and travelling alone. However, some do form pods of up to 3 – 7. 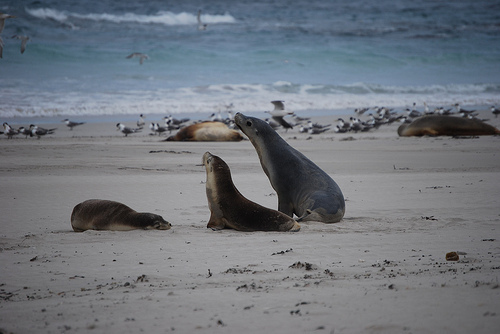 There have also been sightings of larger groups of up to 25 individuals. When feeding, they will consume schooling fish such as sea bream, mullet, herring, and sardines. Like many other dolphins, the Atlantic humpback dolphin is at risk from human activity. This includes being caught in fishing gear. In addition, as they go close to the shore they are often caught in anti-shark nets which are set up in order to protect beach goers from sharks. 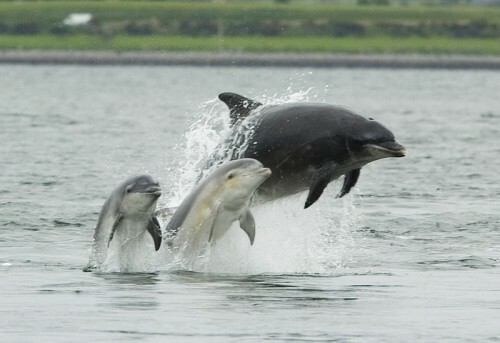 As a result, any coastal development may reduce the habitat of the Atlantic humpback dolphin, which practically forces the decrease in its population.